I believe Gandhi had a good point, and I am choosing to focus on it lately. Unfortunately, I tend to focus on the negative when I am being attacked, repetitively, due to my own thoughts, circumstances, experiences and the things that I choose to dwell upon. Since the passing of my father and the final fallout with my mother, I have been digging up and facing some deep-seated emotions. There is nothing I can say to really express the bitterness and resentment, the pain and sadness, the empty feeling, stemming from the things that I cannot change or go back in time and change, and the fed-up feelings I have towards the disparaging, relentless people who I call my brothers and sisters. “Brothers and sisters?” I have to wonder if I would even want blood brothers and / or sisters. If they were anything like some of the brothers and sisters in Christ, I would probably avoid them. You know, I would bet everything I own on Jesus being the total opposite of some of the “brothers and sisters” that I’ve encountered recently and throughout the years, as well as the one that I once was. I’d bet He would have a great conversation with Gandhi. I was a self-proclaimed master of belittlement. Don’t get me wrong, that is something that I valued in my former life. It is not something that I intentionally enjoy anymore. When I was separated from Christ, like many will claim that I am now while writing this, I enjoyed beating people with sarcasm, making them feel like crap and laughing directly in their faces as I would follow-up by saying, “I’m just joking!” Although, I would then turn around and laugh at their stupidity. I really didn’t care. The thing is, I do care now. I care deeply for others. I care about the things that people tend to do that tears others to shreds. My observation has been so disturbing lately as I’ve seen His supposed people writing, talking, giving sermons and witnessing in His name. Christians, far from the Christ that I know and obviously Gandhi also knew. I wish that Jesus were here so I could sit with Him, and He would just look into my eyes and see the pain within. He could see the hurt and comfort me with His very presence. He could wipe away the tears that fall. I could run to Him, instead of being beaten to a pulp by my awesome brothers and sisters with their Bible thumps and finger points. Telling me that my sin is somehow worse than theirs. “Teaching” me a valuable lesson in their buildings made of gold and their institutions that are robbing the blind of truth and their finances. Showing the sheep how to follow men instead of God. I could run to the One who became flesh and told us to, “Go, and sin no more.” I could run to Jesus, and He would instantly know what ails me, what condition my heart is in, within my fallen flesh. He would know what I’m desperately battling, day in and day out. 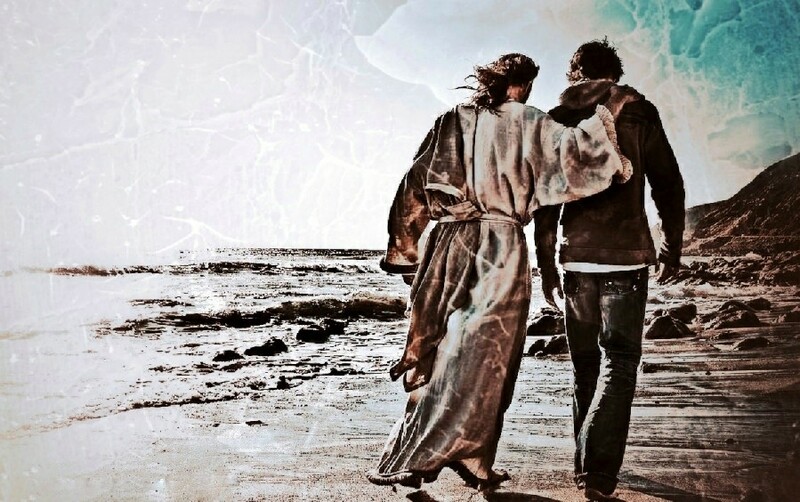 He could tell me that, “It is okay, my son.” He would direct His eyes to His sacrifice for my sins, and comfort me with the knowing that I will one day be with Him, eternally. He would calm these emotions. He would get me away from this world that tends to take its own pain out on everyone else. Those who would rather walk with the world, or the Pharisee. Praise God for the few with the understanding of Christ and Gandhi alike. I remember reading about Gandhi saying that “If it weren’t for Christians, I’d be a Christian. '” He visited a Christian church in Calcutta, but was stopped at the door by the ushers and told he wasn’t welcome. He then rejected Christianity and never again considered the claims of Christ. This is tragic. Wow. Yes, that is tragic. To think that a wise man could have known the truth of Christ, but formed an opinion based on the ignorance of men. Man has destroyed so many relationships with Christ, and will continue to. It is sad that there are many Christians who get things wrong. Sometimes it is their not being mature yet. It is a growth process. There were things I used to say and do as an earlier, eager believer that I won’t say now because I have learned the harm of what I said or did. It was always done with the right heart, but the wrong method. I have learned to extend grace to other believers who do me wrong and pray God helps me build them up, instead of breaking them down. Thank you for sharing this. Yes I am not as mature as some either, and I sometimes struggle with extending grace to others as well. Some people, like myself at the current moment, are tired of the hurts. I’m hard enough on myself, and much of it is a direct result of the sins of others. Praying that He heals these wounds with proper wisdom accrued. We are all a work in progress and have days of ups and downs, good and bad. Praying with you for both of us. I can really relate to what you have written. I see so much of what’s going on in the church and the lack of genuine love is at the top of the list. It has become something that people do without allowing Christ in to change their lives. Believers, if you can call them that, often are no more loving than the average person in the world. The one thing that is supposed to mark us as Christians is our love for one another and yet where is it at? I understand your frustration here and I feel it, too. You are not alone, brother. It’s hard for me to to love as He has called us to. Not only from my own experiences but from those I’d like to call my brothers and sisters. There are honestly, very few that I consider so. I’m tired of this world of hurt, not only from His supposed children, but also from family. They can continue in their misery, without me. I’ll just pray for all of them and continue to walk with Him and my few. One of the things about loving people is we open ourselves up to being hurt by them. This causes a lot of offense in the church. It is hard to love people who are hurting you. But Christ loved even those who were physically crucifying Him and He is our example. I pray that you find healing and peace in your walk. I also pray that you find some like-minded and really loving believers to be around. They are unfortunately in short supply these days. It is a difficult example to follow, one I struggle with daily. May we all grow in our faith and get better at this whole thing along the way. Bless you, brother. Yes I think I get what you’re saying. The title I personally prefer is “Child of God in Christ.” I too am not worthy at times, but in Spirit, I believe we are, being where our hearts are in Him. Blessings Gary.